Goodreads, THE social media site for avid readers, is a virtual version of a book club and a great opportunity to show off your own books as an author, to find new readers and reviewers and join a book lover community. So, you signed up on Goodreads and what now? (I heard this comment pretty often…) First of all you need an audience, as on all Social Media sites and forums. As larger as better! How do I add friends – old and new ones? Adding friends is easy. Before you search for new friends on Goodreads, encourage your existing friends to sign up for a Goodreads account and to friend you on the site. Goodreads has an easy “Add Friends” tool that searches through your existing friends list on Facebook, Twitter or contacts from Yahoo! Mail, AOL, MSN eMail and Google’s Gmail. 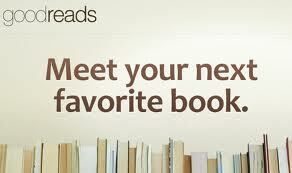 See which friends are already Goodreads members and add them. When you get a “Friends Requests” by email and you go to their Goodreads page, you will see the invitation to add your Yahoo / Twitter / Facebook / Gmail…. contacts to your Goodreads friends on the top right corner. If you already have the profile link for someone you’d like to friend, just go to their profile, then click “add as a friend” which is beneath the “about me” section. If you want to find your friends on Goodreads and you don’t have profile links, just click on the tiny friends icon in the header of your page, which is located directly to the left of your profile image. Then select the “add friends” tab. The “friends of friends” button (a bulk function) works only if you have less than 1,000 friends. But you can certainly click on friends of friends on their site manually and “add as a friend”. You can invite friends from your phone’s address book, your email contacts, or your Facebook friends. 1) From the home screen, tap ‘Friends’ (it should be on the bottom right). 2) On the top right, select ‘Add Friends’. 3) From there, you will be asked where you want to search for your friends. Choose appropriately*. 4) Contacts already on Goodreads will have an ‘add’ button, while contacts who haven’t yet joined will have an ‘invite’ button. Tap ‘add’ to send a friend request or tap ‘invite’ to send an invitation to Goodreads. *Choosing ’email contacts’ will take you into your browser. Choosing ‘Facebook friends’ might open the Facebook app to ask you to grant posting permission – don’t worry, we won’t post anything unless you tap ‘invite’ next to a Facebook contact. Using all these possibilities to add friends to Goodreads you should have a thousand or more new readers / friends in no time. As always, use Goodreads’ HELP section for any questions you might have, and if it is not covered and a search doesn’t bring results, drop them an email.. Listing your print book for a giveaway is a great way to get free exposure for a book before and during its launch. List any title that is not yet released or was released during the last 6 months. Or upload an e-book with the “add e-book” links and let users browse, preview, download, and even purchase your work. If you enjoyed this blog post, please feel free to check out all previous posts of this blog (there are almost 600 of them : ) if you haven’t already. Why not sign up to receive them regularly by email? Just click on “Follow” in the upper line on each page – and then on “LIKE” next to it. There is also the “SHARE” button underneath each article where you can submit the article to Pinterest, Google+, Twitter, Chime.in, Facebook, Tumblr and StumpleUpon. Always learn something when I visit this page! Thanks for sharing.